Learning how to convert PDF to JPG is quick + easy, and you don’t need an expensive application to do it! PDF files are powerful for their small file size. This is why I save my planner printables as PDF files. It means you use the least amount of data possible to receive high quality print files. 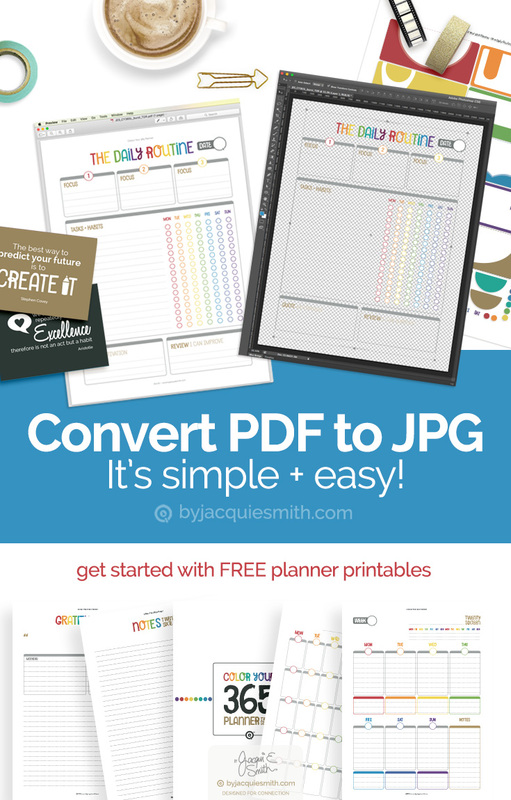 Easily convert PDF to JPG for digital crafters! #Tip : If you’re on a Mac converting between file types is super easy with the Preview app. And there are loads of file types available. First we will take a look at using Preview, an application that comes standard with your Mac and a very powerful and often under used program found in your Application folder. Along with being able to convert PDF to JPG, there are many other file formats available. Open your PDF file to be converted. In this window, click on the menu next to Format and choose JPEG and change the resolution to 300 and chose your image quality. If you are planning to print your image you will want to move the slider to Best. Click Save. #TIP : Export your file to convert PDF to JPG. # Tip : Ensure you have the resolution set to 300 and the best quality if you intent to print. You can choose other file formats here too, such as TIFF + PNG, or any combination of the available formats. You can convert a batch of PDF files at one time using Preview. Simply open all the PDF files you want to convert in Preview. Click within the preview pane on the left side and then click on the Edit Menu and choose Select All. To convert all the selected images select the File menu and choose Export Selected Images. Create a new folder for your new images or simply select the destination to save the files. Choose JPEG and change the resolution to 300 and Best image quality. Click Save. # Tip : These instructions are for individual files only. To convert multiple page documents you can use the Automator app on your Mac. I’ll outline the steps for using Automator in a future article. Using a graphic program such as Photoshop or Elements is great for digital crafters, as it allows you to modify + create with multiple file layers. Launch Photoshop or Elements. I’m using CS6. Open your PDF file to be converted. An Import PDF box will open, ensure you have the resolution set to 300. Click OK. The file will open on a transparent layer making it easy for you to modify the image. If you need to change the size of the page, click on the Image menu and select Canvas Size. Choose the desired units of measure and enter your dimensions. Click OK.
To save your file, select the File menu and choose Save As. Choose your file type, we are saving as a JPEG or to save with the transparent background and layers choose Photoshop. Click Save. #TIP : Ensure you have the resolution set to 300 if you intent to print. #TIP : Change the page size if needed in Image > Canvas Size. The instructions for using Paint Shop Pro and GIMP to convert PDF to JPG will be similar to that of Photoshop. They also allow you to create with multiple layers, making them also great options for digital crafters. Disclaimer : As I don’t personally use these programs I have no screen images for you. Select the File menu and choose Save As. Choose JPG as the file type and the quality you would like. Click Save. # Tip : When you have options for choosing the quality of your file choose 300dpi and the best quality available if you intent to print. See this article for more information about saving files in GIMP. Whatever application you use, it is quick and easy to convert your PDF to PNG files, and a range of other file formats. The most important thing to remember is to select the best resolution for printing.